Fender Guitars of Japan has re-issued many of the classic American-made guitars and basses of the 50’s, 60’s and 70’s. It was only a matter of time until they started reissuing their Japanese instruments from the 80’s. 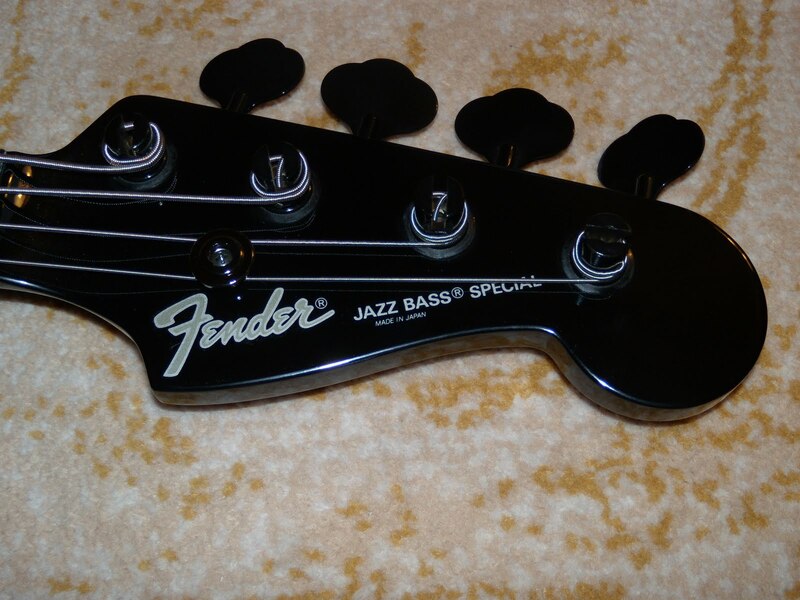 Today’s subject is a very rare bass - a 2008 limited-edition Jazz Bass Special. This IS NOT the Mexican Duff McKagan model, this is a real-live Japanese-made bass. I have collected this particular model of bass for the past 20 years, have owned bunches of them, and it was a treat to be able to find a brand-new one. I found it at one of the Ishibashi stores in Japan, and brought it back with me on a business trip. If you are not familiar with these, basses of this model and color were made famous by Duff McKagan of Guns N Roses, and later of Velvet Revolver. 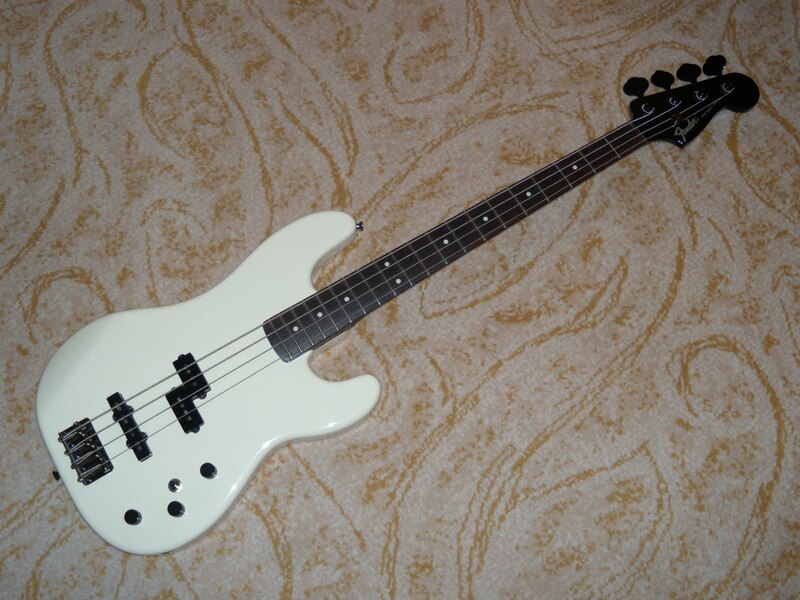 The original run of basses was from 1984 to 1987. 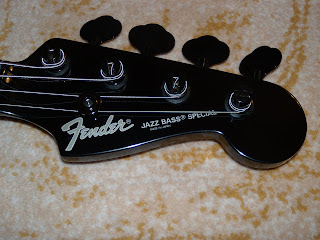 The Jazz Bass Special used a Precision Bass style body, with a Jazz Bass profile neck, and a P/J pickup configuration. This is a passive bass, with 2 volume controls, a TBX tone control and a 3-way pickup selector switch. The TBX circuit emulates an active preamp. From the center position, if it is turned clockwise, it will boost treble and cut bass and turned counter-clockwise, it will boost bass and cut treble. The look is totally 80’s, starting with the P/J pickups to the black hardware and contrasting glossy black-fished neck and headstock. Craftsmanship is up to the usual high standards of the factories that Fender Japan uses. The frets are finished superbly, and the neck pocket fit is super-tight. There is not a finish blemish anywhere on it. A big plus is that it weighs in at 8.5 pounds, according to my digital scale. I have no idea what wood they used for the body, but have heard rumors that they use basswood. How appropriate! These shipped with a nice Fender-logo padded gig bag. Hard cases are pretty rare in Japan, perhaps because they are harder to carry around on the subway. So how does it play? It plays great, and it is solid. It is very versatile, sounds great and would work great for most any gig or recording opportunity. One of the hallmarks of Fender Japan is that when the re-issue a classic guitar, they always get one or two details wrong. This model is no exception. 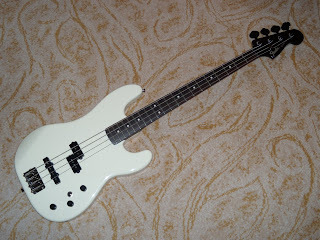 The original basses came with a pearl white finish, while this one is real white. Also, this model does not have the plastic F-marked tophat knobs, using black-anodized barrel knobs instead. Also, I am pretty sure that the bridge saddles are not brass underneath that smooth black finish. I just got one of these an original veteran from the 80's - turquoise metallic seems like a good guitar but needed some restoration to bring it back to working shape, btw, how much are they worth these babies?